This is one of the two stairwells leading up at Pasadena City Hall. What I love most about this area, is the graceful curves and architectural details that follow the green wrought iron railings. Whenever you have a photo like this one, emotion and action always make it better. 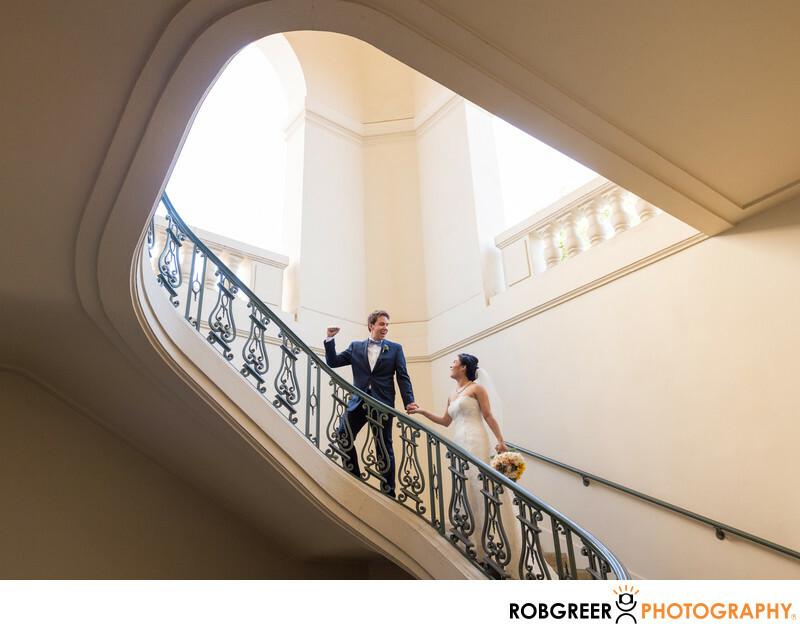 Although any photograph taken in this area is typically striking due to the architecture, there are several factors that make this wedding photograph suitable for my portfolio. First of all, the couple is positioned in an area where they have excellent separation from the background. But more important than that, the groom is holding his fist in the air which indicates some kind of action or celebration. One of my favorite memories from this particular wedding was the super cute grandparents of the groom. They were so loving and playful and were simply a pleasure to photograph. Another thing that made this wedding you need for me, was this was the first time that I had ever photographed a complete wedding at this venue. Although I have photographed couples there for almost a decade and it's one of my favorite, most familiar locations in all of Los Angeles, for some reason I had never booked a wedding at the venue. And now that milestone is behind me. Pasadena City Hall is located in Pasadena, California. Phone: (626) 744-4000. Website: http://www.ci.pasadena.ca.us/. Location: 100 N Garfield Ave, Pasadena, CA 91109.